Construction Accident Prevention: Safety Pays! 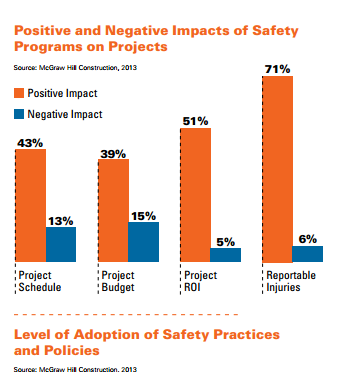 Safety Programs reduce construction accident injuries and significantly improve productivity and competitiveness according to the 2013 report “Safety Management in the Construction Industry: Identifying Risks and Reducing Accidents to improve Site Productivity and Project ROI” from McGraw Hill Construction. Nationally two thirds of construction firms are now following fully inclusive safety programs. Most large firms (more than 500 employees) have adopted extensive safety programs while only half of the small firms (less than 50 employees) have reached this level of safety. The McGraw Hill Construction Report demonstrates that contractors implementing a safety program experience a decrease of personal injuries and an increase in productivity. Half of the contractors using safety programs were able to reduce their project schedule by a week or more. Three quarters of them reduced their budget by 1% or more and a quarter of them reduced their budget by 5% ore more. Adoption of a safety program lead to an increased return on investment (ROI) of more than 1% for three quarters of the construction companies and an increase of ROI of more than 5% for a quarter of them. Contractors also found that the adoption of a safety program improved their reputation and helped them extend their network and obtain new clients. New technology such as Building Information Modeling (BIM),mobile tools, prefabrication and modularization also had a positive impact on safety.